Ole Ask has been involved in music since the age of 14. Ask indicates that music has come naturally to him, as has creating and performing his own original material. Through his work in his native Norway, Canada and the United States, Ole Ask has started to find a home for his musical creativity and unique style. ASK: Flight 653 is Ole Ask's fourth recording and his third on Narnian Records, a local Twin Cities label and part of Cold Wind Music. Ask's latest compilation has a decidedly Twin Cities flavor to it with a backing band that includes such local luminaries as Willie Murphy, Wain McFarlane, Pat Hayes, Bruce McCabe, Billy Franze and Renee' Austin, among others. The end result of Ole Ask's creative talents, coupled with some of the finest musicians in the Twin Cities area, are 14 original songs guaranteed to make Flight 653 a real "high flyer." Several songs on Flight 653 have a distinct blues feel to them, such as "The Radio Is On" with its down home beat and sharp harmonica by Pat Hayes and the blues boogie "We're Only Here For So Long." However, most of the CD reflects other musical genres including pop, rock and renegade country rock. 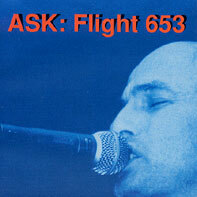 A careful listen to Flight 653 reveals numerous influences and songs that reminded me of songs by Roger Clyne and The Peacemakers, Tom Waits and Bruce Springsteen. Of particular note in the country rock genre are the acoustic-laced "State of Mind," the Spanish-flavored "Upside Down Song" and the touching "I Need You, I Want You." Ask's vocals are not particularly strong, but tend to be rather expressive, matching up well with the original lyrics and unique style. The numerous guitarists playing behind Ask (Murphy, Franze, McFarlane and John Behringer), along with Bruce McCabe's solid keyboards, provide clear, smooth backing and contrast to Ask's unpolished vocal presentation. Among my favorites on Flight 653 were "The Radio Is On," the bluesy "All Of Me, All Of You," the boogie-flavored "We're Only Here For So Long" and "What A Pretty Girl I Got On My Mind," featuring some high-powered guitar by Billy Franze. Ask reflects a Tom Waits/Dr. John feel on the mystical "Welcome," also an excellent song, while renegade country/rock lovers will also enjoy "Here We Go Again." If you enjoy original music and the collective talents of a group of the Twin Cities finest musicians, you will find ASK: Flight 653 interesting and entertaining. To find out more about Ole Ask and to order a copy of ASK Flight 653, visit the Cold Wind, Inc./Narnian Records website at www.coldwind.com. Remember to get there early so as not to miss your trip on Flight 653. This review is copyright © 2001 by Dave "Doc" Piltz, and Blues On Stage at: www.mnblues.com, all rights reserved. Copy, duplication or download prohibited without written permission. For permission to use this review please send an E-mail to Ray Stiles.